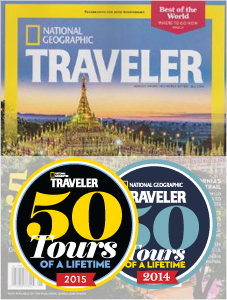 At Global Basecamps, we talk a lot about “Cultural Japan Tours,” but what does that entail, exactly? Is Japanese culture the ancient, the samurai, the castles, the tea ceremonies, and the ryokans? Or is Japanese culture the modern, the bright billboards, the manga, the bullet trains, and the pod hotels? The answer, of course, is both. But whenever tradition and modernity can meet and become something new, that is what really excites us about culture in Japan. Few things are more timeless in Japan than fish, and the Tsukiji Fish Market could be described as fish central for Tokyo tours, as well as one of the biggest fish markets in the world. The market accepts a limited number of casual observers daily, and early risers will find a bustling, vibrant, coordinated dance of fishmongers, restaurant owners and sushi chefs negotiating for the day’s best catch. For Japanese food enthusiasts, this experience is almost like getting a peek behind the curtain, or watching the foundations being laid at a construction site. 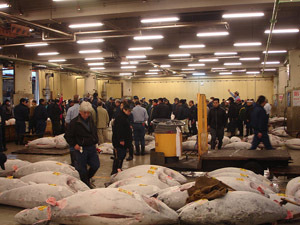 By far, the most exciting time of day is from five to six in the morning, as the tuna auction is in full swing. Connoisseurs walk up and down rows of tuna, hurrying to pick the best specimen and negotiating with mongers. In fact, this spectacle has become so popular for visitors over the years, that they began to interrupt the flow of business in the market. Daily limits were put in place to curb the potential disruption, keeping the visitor count at 120 per day. To be admitted into the tuna auction, one must show up at the Osakana Fukyu Center, which begins accepting applicants at 5:00am on a first come, first serve basis. A group of 60 visitors is allowed into the market at 5:25am, and a second group comes in at 5:50am. Visitors who show up later than 5:00am usually end up waiting 50 minutes for the second admission. During these visits, it is important to remember that this is a place of serious, fast-paced business, and visitors should stay aware of their surroundings so as to not interfere with the process. Designated standing areas are clearly marked. There are plenty of areas in the fish market that are completely off limits to visitors, so keep an eye out for the English signs indicating so. Travelers are encouraged to spend time in the outdoor market of Tsukiji, which sells everything you find inside in smaller portions - perfect for casual shoppers. Another draw to the outdoor market is the nearby sushi restaurants serving breakfast beginning at 5am. To get a taste of the fish purchased at the market daily, we recommend visiting Shin Hinomoto, on exit 2 of the Hibiya - Chiyoda line of the Tokyo subway. 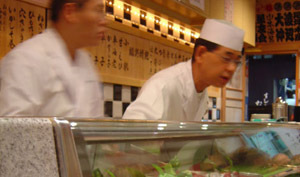 Much of the world’s best sushi is found in the city’s subway system, and this particular bar is run by Andy-san, a British national who has been buying his fish at Tsukiji daily for 25 years!